As a specialist and leader in the infrared sauna and traditional sauna industry, we understand the importance of making the correct buying decision that will hugely reduce the risk of problems with your sauna. The following is essential advice to read and check before you buy your new sauna. A sauna should be a real investment adding not only luxury but also value to your home. It is therefore important that you make an informed decision and choose a sauna that is going to last and look the part. There are many fly-by-night companies that can be found on the Internet who are more than happy to take your money in exchange for a sub-standard product. When you have a problem then the company is difficult to contact and may have changed their name, alias, or gone out of business. Do your research and make sure you choose a reputable company, otherwise your warranty and guarantee may turn out to be worthless. If you are unsure it is always good to check the business name, company number and VAT number. Aqualine are an established company that have been around for years. We have a clean credit record and carry no debt. We are registered in England and Wales No. 6267371, VAT No. 931 3931 33. We are also experienced with electrical/plumbing requirements and have a thorough knowledge of the items we sell. We are not just resellers or sales people. We can trouble shoot or help with installation and other questions that electricians, plumbers, and carpenters may have on items purchased. We know our business. Not only do we deliver in 3-5 working days, we have dedicated drivers to ensure that your sauna arrives safely in one piece. We can also offer next day delivery in most cases*. You will be advised on the delivery date via email soon after checkout of your order, which will be delivered within the timescales shown in the table below. Many companies copy or clone products, almost the exact same looking product, but thinner metals, thinner woods, cheap parts, poor craftsmanship; things to watch out for, inferior products. Our saunas are made from the Finest Grade Non-allergenic / Non-toxic Canadian Hemlock or Canadian Red Cedar and are built with solid tongue-and-groove construction. Thick tempered safety glass is used on all saunas for heat retention. They are compact, easy to assemble, they take only minutes to heat, plugs into a standard household plug, stands off the floor on 4 legs and won't damage your flooring. Also do not forget our proven strict quality management certifications and wide range of accessories. All our infrared saunas are classed as Far Infrared saunas. This is the most beneficial infrared treatment for your health. We use a double cladded wall section, which also has a cavity. This is important to help retain the heat in your infra-red sauna, this also helps keep the running costs of an Aqualine sauna lower than similar saunas on the market. All wall sections are made to fit together precisely. This makes our infra-red saunas very rigid and of a solid construction. Many companies use Hemlock or Cedar just on the main panelling of the saunas then substitute the rest with cheaper woods such as plywood. All of our saunas are 100% all out of the same wood. Furthermore they are totally brand new, we do not sell refurbished, used or scratched items. Furthermore all SaunaMed™ saunas are assembled in the UK. Click here for information on the benefits of Infrared Saunas and Traditional Saunas. There are many types of wood to choose from, however we have carefully selected the finest Canadian hemlock as this wood does not give off toxins, under high temperatures, which pine and Sitka wood do. Our Hemlock also has a fine grain and virtually no knots, which eliminates the chances of splinting or any rough surfaces and gives a softer feel. Hemlock is known for its natural strength and durability; it is naturally resistant to decay therefore ideal for sauna uses. Its longevity is 300 -1000 years, most other woods average 200 years. Hemlock is commonly used for bridge timbers, house sills; the grain patterns are dramatically beautiful so it is prized as material for flooring, panelling and trim. Hemlock is a strong, safe, very attractive and has an even grained wood texture. Canadian Red Cedar wood gives off a pleasant aroma that can also have a therapeutic effect, as shown by thousands of years of tradition. When used for burning, cedar wood strengthens and harmonises, while the essential oil has a calming and soothing effect on nervous stress. The Indians used cedar wood for all respiratory problems as well as for arthritis, rashes and menstrual pain. Hand selected finest grade A Canadian red cedar is by far one of the most expensive materials to source, which is why most sauna companies come up with excuses as why they are not using it and select cheaper woods such as basswood, spruce, pine and low grade hemlock. It is important that the wood is correctly cured to avoid warping and splits when the sauna is heated and cooled. If the wood is not correctly dried before the sauna is manufactured then over time this warping can lead to problems such as gaps or even problems in closing the door. We kiln dry all of our wood, which means that the moisture content of the wood is within optimal standards, ensuring the wood will not twist and warp over time. The colour of cedar wood can vary between samples from the same tree. Therefore, during the production process a special wood-selection procedure guarantees that the wood used for any one sauna has a very close match to give that designer finish. Furthermore 100% of our wood comes from Canadian renewable forests. Ceramic infrared sauna heaters are more advantageous as they heat up much faster, have a high emissivity and they are known for high levels of durability. Ceramic heaters are the most common and popular choice. SaunaMed DuraWave™ ceramic heaters are also very easy to ship and replace should a problem arise, unlike carbon heaters that can be awkward to ship and difficult to replace. Far Infrared Saunas which use pure ceramic concave shape emitters are backed by a long history, extensive medical research and results. If you take a look around it is why the most experienced and health orientated companies use ceramic elements. Infrared efficiency dropped dramatically when sitting more than 20cm away from the elements. Meaning much of the infrared heat sources are not warming the body efficiently but simply warming the air. The elements have to be thermostat controlled which meant that cabin temperatures would have to be much higher to produce any level of sweat production. To create the internal temperatures and Infrared flow required for the elements to be effective, the majority of the cabin interior needed to be lined with the elements which was very unsightly. Wooden brackets holding heater panels in place created a trap for dust and bacteria and absorbed the infrared heat rather than your body. Sweat stains on the elements were difficult to clean. Carbon heaters give off very high levels of EMR (Electromagnetic Radiation). Toxic chemicals are used in the production of carbon heating elements. Compounds of styrene, lead, iron, aluminium, zinc, boron and barium are introduced into the sauna. We found it absolutely unacceptable to introduce lead, and especially styrene in a therapeutic environment designed for detoxification. DuraWave™ Infrared Heaters use technology which encompasses 100% pure ceramic elements filled with lava sand to give the best heat distribution and include no chemicals or toxins. All humans send and receive Far infrared waves. The range of waves generated by the human body is 6 to 20 microns. The optimal micron output range is between 7.5 and 15 microns which is very close to the resonant frequency of a water molecule. This similarity makes sense since our bodies are almost 70% water. DuraWave™ infrared heaters have been designed and calibrated to target the vital wave range of 7.5 to 15 microns with a good portion of wavelengths at 9.4, which is the frequency at which a water molecule resonates or vibrates. This vibration causes a release of cellular toxins such as mercury, aluminium, cholesterol and other toxic gases such as sulphur and formaldehyde. This optimal micron output also allows for deeper penetration of Far infrared heat, which improves pain relief, detoxification, circulation, and increased peripheral blood flow. They are also designed to be safe to touch and comfortable to sit against. Regular clinical tests demonstrate that DuraWave™ infrared heaters produce far-infrared rays close to perfection to work with the natural harmony of the human body resulting in increased health benefits. Often, many products have not been tested making it very difficult to verify their safety and peak infrared output wavelength. Because Far- Infrared Rays travel in a straight line, conventional Infrared heating elements cannot reach every part of your body. This is the main problem with carbon elements meaning the whole of the sauna interior has to be covered with this material. DuraWave™ pure ceramic Far-Infrared Heaters are coiled in a concave shape and use surgical-grade stainless steel wide-projection deflectors designed to concentrate and maximize infrared output towards the body. So no matter how you are positioned in a SaunaMed Sauna, whether you are directly in front of a heater or not, your whole body is effectively receiving the beneficial Far-Infrared Rays and there are no cold spots. Far Infrared saunas which use pure ceramic concave shape emitters are backed by a long history, extensive medical research and results. Far Infrared saunas using pure ceramic emitters have a long history (decades) of use, results, and confidence, not only by the manufacturers, but also by doctors and people who use them. Many of the books published, and research of naturopathic doctors have been based on the far infrared saunas using pure ceramic heating emitters. DuraWave™ heating elements were also developed to solve the fundamental issue with the chemicals used in the production of carbon heating elements. Carbon heating elements, start as two pieces of flexible fibreglass (plastic resins and glass cloth). A thin conductive layer of carbon is printed onto the fibreglass, then fibreglass pressure laminated to complete the assembly. Through this process compounds of styrene, lead, iron, aluminium, zinc, boron and barium are introduced into the sauna. We found it absolutely unacceptable to introduce lead, and especially styrene in a therapeutic environment designed for detoxification. Ceramic infrared sauna heaters are more advantageous as they heat up much faster, have a high emissivity and they are known for high levels of durability. Ceramic heaters are the most common and popular choice. Our DuraWave™ ceramic heaters are also very easy to ship and replace should a problem arise, unlike carbon heaters that can be awkward to ship and difficult to replace. Carbon Infrared heating elements cannot reach every part of your body as the rays travel in a straight line. This is a problem meaning the whole of the sauna interior has to be covered with this material. DuraWave™ pure ceramic Far-Infrared Heaters are coiled in a concave shape and use surgical-grade stainless steel wide-projection deflectors designed to concentrate and maximize infrared output towards the body. So no matter how you are positioned in a SaunaMed Infrared Sauna, there are no cold spots. To create the internal temperatures and Infrared flow required for the elements to be effective, the majority of the cabin interior needed to be lined with the black carbon elements, which was very dark and unsightly. Carbon panels in general give of very high levels of EMR (Electromagnetic Radiation) and there is no way to shield this. Wooden brackets holding the carbon heater panels in place created a trap for dust and bacteria and absorbed the infrared heat rather than your body. Sweat stains on the carbon elements were difficult to clean. Infrared saunas have anywhere from 1-12 ceramic heating panels to deliver infrared heat. 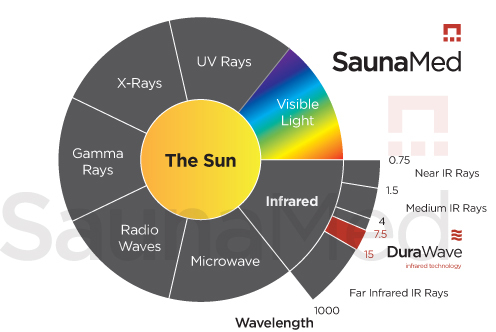 When you are comparing saunas (make sure your comparing the same size models), consider how many infrared panels the sauna has as well as the size of the panels, this adds much value to the sauna. The panels should surround you. Panels behind, in front, on the sides, on the calves would give you the best coverage. Many companies will try to cut down on the number of heating panels to save them money. Consider the use of glass as it does not retain heat as efficiently as wood. Our saunas are well balanced and designed to be as efficient as possible. We have ensured that our saunas are silent in operation to aid in your relaxation. These may be hidden extras, not shown to give the impression of a lower selling price. Make sure you buy from a company who offers you transparent pricing. To cut costs some companies will hold very limited or no stock and simply order or start manufacturing a sauna on receipt of your payment. Typically, this will result in a delay of approximately 6-12 weeks until your sauna is ready for delivery. Make sure you check availability sooner rather than later. Buying cheap may result in little or no after-service support. Check that you are supported in the event of a breakdown and for how long your product is guaranteed. Aqualine maintain a 5-year cabin guarantee and 2 years on electric parts, with added after sale support. Also do check exactly which sauna parts are covered, with Aqualine everything is covered including the lightbulbs. We hold a large stock of replacement parts for all of our saunas, in the unlikely event there is a problem outside of the warranty period we can ship them via next day service. We supply them at cost price and do not make profit on spare parts. Which gives you that extra piece of mind. All the material we use is non-allergenic, non-toxic and environmentally friendly. Our wood comes from renewable forests. Furthermore, we ensure Aqualine electric parts are certified and energy efficient, they consume less electricity than that of standard units. Not only does this save energy, but money as well. We also go a step further and ensure that all of our products are manufactured to ROHS standards, which restricts the release of Hazardous Substances. We manufacture to the ROHS directive and conduct VOC Testing- (Volatile Organic Compounds) as we use no chemicals or toxins in our sauna cabins as this could result in toxic fumes being released during operation and these chemicals could easily be absorbed by your open pores. All SaunaMed products are certified to be free of VOC’s. As our items are packed flat, they are transported and moved around the home easily. All of our items are easily assembled and include clear simple instructions. This means that we do not charge you extra for things you can easily assemble on your own. However if you would like someone else to do the work, we can, in most cases recommend independent installation and assembly services in your local area. Just contact customer services for more details. Installation should take about thirty minutes. We provide you with an easy to read ‘step by step’ manual. Our saunas arrive flat packed in 2 or 3 large boxes, depending on which model. This also makes it easier to take with you if you ever decide to move house. All wall sections are made to fit together precisely, this ensures that our infrared saunas are very rigid and have a solid construction. We have a Secure Online Payment system, as you may not always be comfortable giving your financial information over the phone. Consider the accessories and features included with your sauna carefully. The ability to control the sauna from inside and out, timer functions, oxygen ioniser system, aromatherapy, air vents, lighting, drinks holder, magazine and towel racks are all extra features that you will really come to appreciate with use of an Aqualine sauna. Also do check that they are included in the price as there may be extra charges. All our accessories are included in the price. Do you get to speak to a sauna specialist straight away who can answer all of your questions? Beware if not. The sauna you buy is only as good as the company behind it. All SaunaMed Saunas run on standard 240 volt/13 amp home wall plugs. You will not need to change your electrical wiring to run our range of infrared saunas. Many sauna companies fail to explain the differences in wattages, volts and amps 13 amps equals 3120 watts. Any sauna requiring more wattage than 3120 will require you to upgrade to a heavier duty circuit. Many sauna companies cut costs here by offering the bare minimum certification of CE which is compulsory for the EU market. Electrical Testing Laboratories (ETL) was founded in 1896 by Thomas Edison, and is one of the oldest product safety testing laboratories in the world. Certification by ETL and ETL-C assures you that all signature models have been tested to meet the required safety and performance standards. The RoHS Directive stands for "the restriction of the use of certain hazardous substances in electrical and electronic equipment". GS - Recognised throughout Europe and particularly important in Germany, the independently authorised GS mark shows that a product complies with the minimum requirements of the German Equipment and Product Safety Act. The GS mark shows a product has passed safety tests, exceeds legal standards and is of a high quality. The ISO9001 standard requires a continual improvement in the operating processes and quality management system. This standard is important as it guarantees a consistency in product and service that will achieve customer satisfaction. Our manufacturing facility has implemented a quality management system in order to maintain the highest standards in product development and quality assurance. Besides these approvals, all of our electrical wiring is encased in stainless steel fireproof conduit. Why is this important? You do not want faulty electrical wires touching dry wood! The health benefits of regular sauna use are the main reasons why people are installing home saunas in record numbers. Almost any size of home can accommodate our range of saunas. Click here for information on how our range of Infrared and Traditional Saunas can benefit your health.